Commercial outdoor sofas and double seating are hard to come by and can often be underwhelming, that’s not the case with the Mayfair Furniture commercial outdoor sofa range. All outdoor sofas that we offer are contract grade and designed to deal with not only the weather but the fast paced environment of your business. We know how important it is to have flexibility when it comes to outdoor furniture and that’s why our sofas are easily usable, easy to move and can cope with any type of weather. 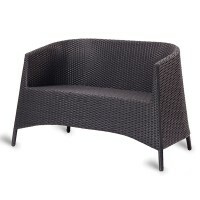 Our Malta weave outdoor stacking twin tub sofa chair and Miami rattan sofa are designed to suit all restaurants, bars, hotels and pubs. Not only will your guests enjoy the comfort of the seating, they’ll also remember your business for all the right reasons. With our commercial outdoor sofas we don’t hold back and with competitive prices across the collection you can’t go wrong at all. Feel free to get in touch if you have any questions or need some extra information about any of our products, our helpful team will be more than happy to help you pick out the perfect outdoor sofa for your business.